Isabel originally graduated in Biomedical Laboratory Sciences in the Polytechnic Institute of Porto (2006-2010), where she integrated the degree programme in Biomedical Laboratory Science of Metropolia University of Applied Sciences in Helsinki (2010). Isabel took a second degree in Applied Biology in the University of Minho (First Class Honours, 2010-2013) where she continued for a Master’s degree in Health Sciences (2013-2015), having developed her thesis in the Neuroscience Research Domain of the Life and Health Sciences Research Institute, with a particular interest on the role of lipid signalling pathways in hippocampus functioning. 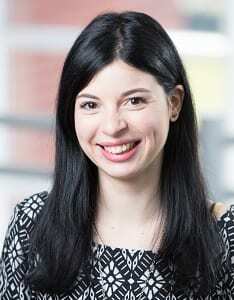 She moved from Portugal to the United Kingdom in September of 2015 to join the Complex Disease Epigenetics Group as a PhD student (University of Exeter Medical School, Alzheimer’s Society Doctoral Training Centre), under supervision of Professor Jonathan Mill and Dr Katie Lunnon. Her PhD focused on evaluating functional genomics of rodent models of Alzheimer’s Disease and integrating these findings with previously obtained human data from the group, in order to understand its relevance to human dementia. Isabel is now working as a research fellow within the group, expanding on her findings from her PhD thesis.